In June of 2016 I officially joined Spotted Fin, I did not do this lightly but only after a lot of thought and soul searching, it felt right on so many levels for me to join this lovely company. When I first met Pele Johnson, the enthusiastic owner, it was impossible not to be impressed with his stunning set up and obvious care and attention to detail. Pele was far from the usual bait company type of owner he was from the corporate world of banking, light years away from the bait game but my word his bait findings and thoughts were very different indeed, highly technical and certainly ground breaking. I think what really struck me at that inaugural meeting at Spotted Fin’s warehouse and head quarters, was the sheer quantity and quality of bait ingredients at their disposal, it was super impressive! The other striking thing was the cleanliness of the place, you could literally eat your dinner off the floor there it was that spotless. This attention to detail might sound a bit superficial, but to me it is very important. You see it’s like this, if I go in a restaurant and it’s dirty and unclean, imagine what their kitchens and processes are like that you cannot see! It’s a show of intent and attention to fine detail is exactly what I like. After our initial meeting I had very little hesitation in getting involved and out on the bank trying the flagship bait ‘The Catalyst‘. First impressions were it looked and smelt superb and had a very different feel to it from the usual baits you see out there, which are in many cases much of a muchness, it had its own unique signature that set it apart from so many other baits. First impressions of the Catalyst were very good! That quality feel to a bait is always good to see, but of course it’s the performance that’s the key to everything. I was not to be disappointed ‘The Catalyst‘ is both instant and consistent, it just keeps working! I have been carp fishing an awful long time, nearly 50 years to be truthful and within a matter of months I had beat my PB mirror with a fish of 67lb 11oz and my PB common with a 70lb 2oz monster using this stunning bait, how could I not be super impressed? Not only that but I had caught on every single water I had tried the bait on including many big back up fish to my new personal bests. As my working relationship and friendship with Pele grew, we decided the next step in the brand would producing a small bespoke range of fluoro hook baits in both pop ups and wafters, as this is a particular specialist area close to my heart I was allowed to have input over a range which is a lovely show of trust in me I have to say. We settled on five of my very favourite, most productive recipes and combinations, all have their merits and attributes. I often get asked “which is the best” and the answer is it’s impossible to say. They are all stunning and I still have problems myself choosing which I want to try first sometimes, but usually settle on trying a different one on each rod until I find the winning combo on the day. The repeat sales and superb catch results speak volumes about this range and makes us very proud. I remember two of the lads on one of my organised trips to Italy in the winter struggling until they tried one of my all time favourites the Fruit Zing and it was like throwing a switch they said, as they proceeded to catch 64 carp with both having new PB carp to mid 60s. I only have to see the change in results like the ones Dave and Arezue Wright have had since deciding to change to Spotted Fin. Both of these working weekend carp anglers have repeatedly smashed their expectations and PB carp many times over the last year and have never looked back as have so many others who have given the Spotted Fin range a bash. 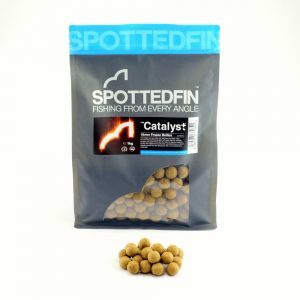 We knew the Catalyst would be a hard act to follow but felt the time had come to give the choice of a classic fishmeal food bait. I have been involved with producing fishmeal baits since the late 80s and have vast experience of this type of bait and as an angler I like that option as I find some waters are very solid fish meal venues historically. Breaking a long standing PB is always a good sign. We agreed I should undertake the job of engineering the fishmeal food bait and I had what I would class as a fully evolved tried and tested recipe that I knew would be perfect and as good as it gets. 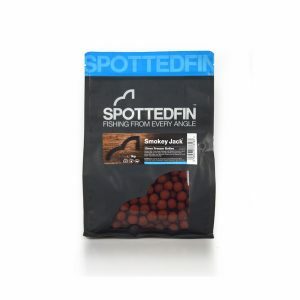 Now known as ‘Smokey Jack‘ I have to say the reception the bait got upon its launch was sensational and again the feedback was magnificent, it makes us all at Spotted Fin proud of the baits we produce, quality and consistency is our aim and I think it shows.